The last Christmas Cookies are eaten up, the Banana Bread was run off long ago – so there’s nothing in the way of light and delicious recipes. For this purpose I’m continuing with my Project ‘From my Fridge’ – finally. I love to cook spontaneously with whatever is left in my fridge and therewith I’d like to show you how easy and intuitional cooking can be. From my fridge is a collection of recipes that came up outside my fancy fooblogger existence with the sole purpose of making me full and happy. Usually when I shoot a new recipe for you there’s lots of leftovers which I unceremoniously fling in the pan and revamp a little. This kind of arbitrariness spontaneity and creativity is exactly what I want to share with you. Cooking does not mean to copy the instructions in a cook book one by one. Sometimes it has to be quick and dirty and it shall delight your tongue nevertheless. Got some leftovers from your Low Carb Cauliflower Rice Sushi? 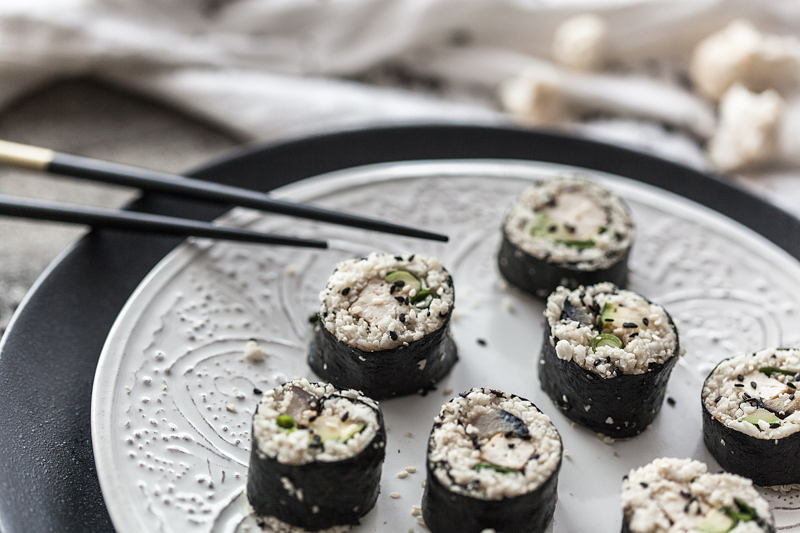 In the case you’ve tried my recipes for Cauliflower Sushi and you’ve got – for what reason so ever – huge amounts of cauliflower rice left, here’s my idea for you. A light and filling vegetable stir-fry. Just take whatever vegetables you have and be happy for doing something food for your body. Oh my, food can be so giving. 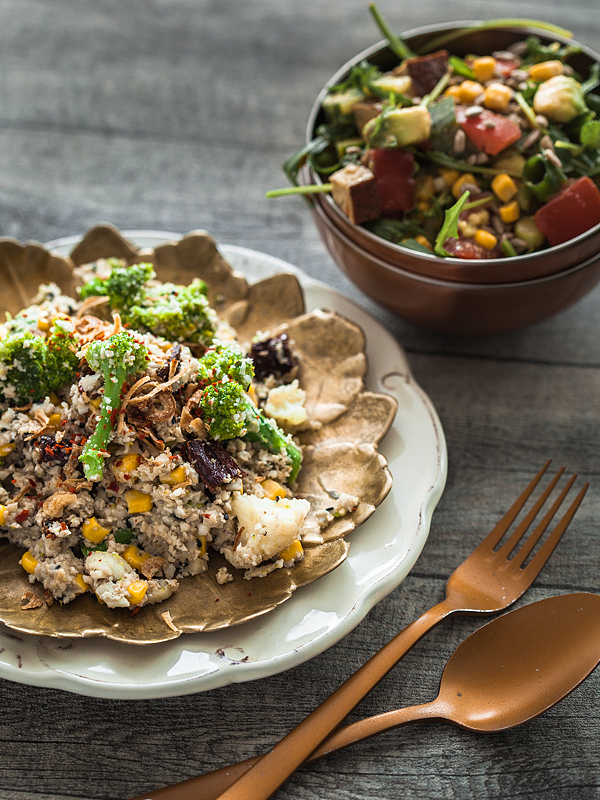 Prepare the cauliflower rice after this recipe. Cut the brokkoli/cauliflower into small florets and rinse it under cold water. Boil it in salt water for 5-10 minutes until the desired firmness to the bite is reached. Dice the dried tomatoes. Peel and mince the garlic. Let the canned corn drain through a sieve. For the sauce stir together cream and almond butter and add your spices of choise and as appropriate add some water. Heat oil in a pan and fry the cauliflower rice and the garlic primarily. Add the other ingredients and fry for a couple of minutes. Pour the sauce over, stir it and bring it to a boil. Then serve immediately and garnish with chili flakes and roasted onions.